Two years ago, Dorrie Casey, who’s done pretty much everything else in theatre, decided her next adventure would be a festival of new plays. Add producer to her credits, please, because starting tonight, five new plays by North Carolinians will debut at the Carrboro ArtsCenter. Heavily underwritten by Casey and produced by her and Jeri Lynn Schulke, the artistic director of ArtsCenter Stage, REDBIRD promises to be as showy as its name, with the five works premiering over two opening nights. It’s a significant milestone for non-university theatre here. Tonight’s first first night will include Michael A. Smith’s adaptation of Nancy Peacock‘s first novel, Life Without Water. Peacock is my contemporary (Chapel Hill High School Class of 1972) and the world she imagined in her book resonated strongly with me–and with Tom Marriott, who directs. He too has lived without water. “The play is very, very moving for me,” he said, “and to have Marcia Edmundson and Jane Allen Wilson—!” Here he threw up his hands and grinned with the delight of working with these two splendid women. Marriott’s been making theatre in the Triangle area since 1969, “poor theatre,” as he says, and has been a crucial instigator in the birth and growth of the “not-PlayMakers theatre scene” currently thriving here. This is an ideal situation for the birth of a new play: everyone involved knows everyone else’s art and can also bring intensely local knowledge to this work. The newest member of the team is Joseph Amodei, who’s doing the multimedia. The photographer Catharine Carter is another longtime Chatham County person, and for the backdrop imagery she has photographed the house Nancy Peacock lived in back in the day. Also on tonight’s bill is the ineffable Jane Holding, who has adapted a story from her friend Allan Gurganus’s recent Local Souls. Holding and Gurganus have been friends since 1969, and share similar eastern North Carolina backgrounds. 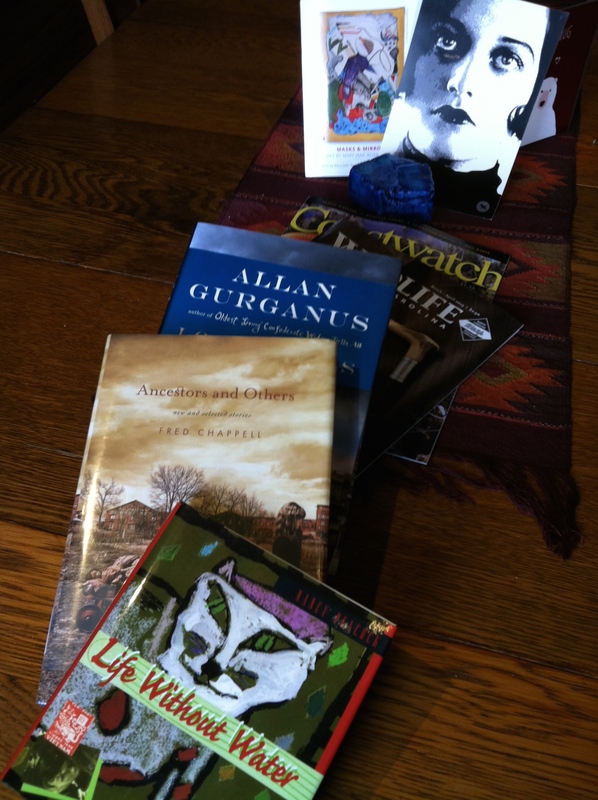 Part of their friendship involves reading to each other, so Holding knew Gurganus’ characters and their stories long before the book was published, and knows their language and their rhythms deep in her soul (Holding collaborated with Gurganus on the stage adaptation of his Oldest Living Confederate Widow Tells All). Holding will embody Jean, mother of Caitlin, for whom Jean put herself in the background. But in Saints Have Mothers, Jean’s back up front. Holding has told me that this story was important to her, as “more than anything, I wanted to be a good mother.” The insightful Tamara Kissane directs. Of course, Holding and Kissane have previous theatre connections, too–Kissane played Holding’s daughter in Little Green Pig’s fantastic all-female Richie. Just to prove that ALL the excellent writers in the state do not live in the Triangle, Greensboro will be well-represented in the third piece on tonight’s bill, Linnaeus Forgets. The short story’s by my hero Fred Chappell; the adaptation by Marianne Gingher and Debby Seabrooke. Lenore Field, Greg Hohn, who also directs, and the indefatigueable Tom Marriott will act (and waltz), and Jimmy Magoo will handle the puppets. On the 14th, the second opening night will feature another new work by Howard L. Craft, whose Freight was such a smashing success in January (it will receive a New York production this summer). Craft has adapted from historian David Cecelski’s book for The Fire of Freedom, and the character Abraham Galloway will be played by Jade Arnold. Chaunesti Webb directs. The REDBIRD’S fifth work is Property, by Dana Coen, director of the UNC-CH Writing for the Stage and Screen program, and examines outsiders’ and locals’ relationships with the land and “sustainability.” Coen directs Alex Thompson, Melanie Rio and Brandon Rafalson. REDBIRD has a design team, too, studded with well-known local names. The whole damn shebang is stage-managed by the amazing Emma Nadeau. “She’s the hub of the spinning wheel,” said Jeri Lynn Schulke. Maybe if we stomp our feet, she’ll come out at the end with her accordion. 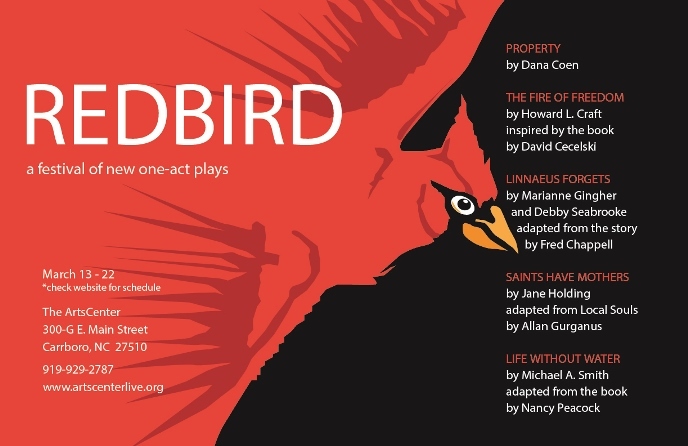 REDBIRD runs two weekends only! with the shows in rolling repertory. Check http://www.artscenterlive.org for which is when, and get your tickets. Opening tonight at the Carrboro ArtsCenter: INTO THE BREACH, Ian Bowater’s new play, commissioned by the ArtsCenter for its season examining World War I. Bowater, who is English and has had a long career in theatre and film, has crafted a thoughtful play centered on a group of “Shakespeare’s Boys” and their schoolmaster from Stratford-on-Avon, who all leap or are pulled into the vortex of the war. Left to Right: Jeb Brinkley, Brandon Rafalson, Justin Johnson, Peter Vance, David Hudson portray men from Avon who take the one-way trip to war. Photo: courtesy of Jason Abide. After Taylor Mac’s flippant brief gloss on WWI in his recent performance in Chapel Hill, Bowater’s play is refreshingly serious. Its characters are more types than individuals (I saw a dress rehearsal), but they are real types (including the very English proto-Nazi), and through them we can glimpse the way those types both shape and are shaped by large historical forces. They are the men–the glorious dead–whose names etch memorials in every English village and town, and in towns all over the then far-flung British Empire. The boys studied and played Shakespeare’s Henry V at school, and in this play, they study it again as they prepare a show for the other men at a hospital not far from the battlefront. The play reveals different things to the men now, and they find the leaden tones along with the golden in the great speeches, as they grapple with the (im-)morality of Realpolitik. They are joined by Laurel Ullman as Nurse Ailey/the Angel of Mons. Director Gregor McElvogue, also British, brings his skill at eliciting both the brutish and the bruised from the performers, and with his usual careful reserve, gives us a fresh context for the war that did not end all wars. The waste of that war becomes more poignant and pitiful when we see it driven (in part) by the pride of “the men of Agincourt,” “the band of brothers,” who had so recently celebrated the harvest with song and beer. The big surprise of the show is the songs. 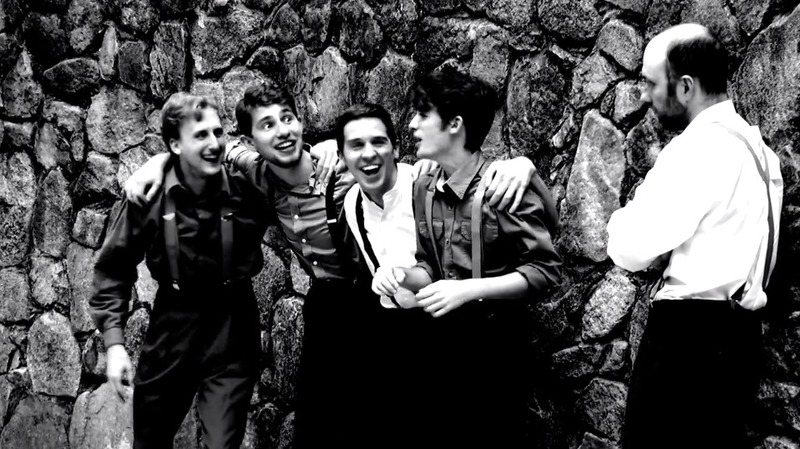 The cast does a wonderful job, from the harvest songs to popular ditties (inky-dinky parlez-vous! ), and the song and dance routines make the pall all the darker in contrast. The show runs Oct. 10-12 and 16-19. Teachers from the 2013 NCRT Festival, Michelle Dorrance, center. Photo: Denise Cerniglia. “The Greatest Tap Show Ever” may not always hold that title, but the show I saw last night at the Carrboro ArtsCenter was certainly the most purely enjoyable tap show I’ve ever seen. Presented by the North Carolina Youth Tap Ensemble (celebrating 30 years, thanks to the buoyant leadership of Gene Medler) and the North Carolina Rhythm Tap Festival, the show featured half a dozen first-rate teaching tap artists in town for the 3-day festival/workshop, accompanied by the excellent dance band combo of John Hanks, Robbie Link and Jim Crew. Sadly, Medler was down in the back and not able to join the other dancers on stage, but otherwise the whole event had an insouciant air of mischievous fun, with everyone cracking jokes and peeking from behind the stage curtains. Michelle Dorrance, local heroine now taking the world by storm with her company DorranceDance, performed short joyous dances, but also one longer work that hinted at what a very special performer she is. Along with a graceful style and complex sense of rhythmic progression, she brings powerful emotional intensity to the stage. I’ve seen some fine tappers, but I’ve never seen anyone choreograph tap as if it were avant-contemporary dance. She’s got some unusual moves, uses her arms and hands very expressively, and looks outward to the audience even while her feet draw intricate patterns making her shoes sing with textured tones. Whether you were or weren’t in the sold-out house at the ArtsCenter, you may wish to book tickets for Carolina Performing Arts‘ presentation of DorranceDance on Sept. 25-26. Each of the other dancers–Derick Grant, Nico Rubio, Melinda Sullivan (who danced and sang “Too Darn Hot”) and Joseph Wiggan–was nearly as impressive as Dorrance, and each has a distinctive style and impressive credentials. All performed delightful turns, showcasing their special moves, and challenging and copycatting each other in the finale. It was just so charming–partly because it was on the tiny stage (well-miked for the dancers) of the tiny ArtsCenter where everyone’s practically on top of everyone else, and the waves of love flow unimpeded from stage to audience and back again. As spectacular as the dancers were, and as solid as the band was, there was no doubt as to who was the diva. Ms. Yvette Glover–Savion Glover’s mama–commanded the proceedings with twinkling majesty. Having known most of the performers for years, and some since they were toddlers, she bossed them around and was fussed over by them in return. Between emceeing, she sang two songs in an enormous voice time has rasped but not ruined. Flying in, she said, she was so struck this time by the beauty of the trees, so she commanded the band to learn the music to accompany her on the sung version of Joyce Kilmer’s Trees (here’s Paul Robeson singing it.). Later she sang, a cappella, a heart-expanding version of “His Eye is on the Sparrow,” and you could have heard a pin drop between phrases, the house was so quiet. Then the thunder of tapping feet resumed, playing out the secret rhythms of the heart.